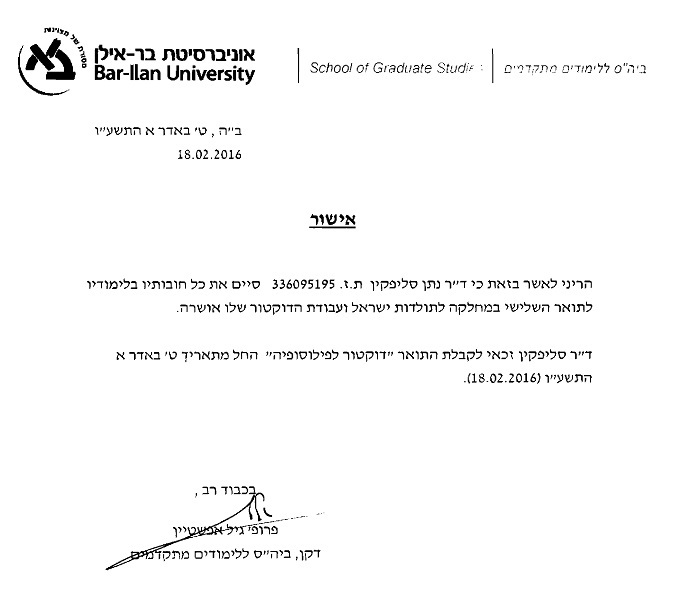 I am pleased to announce that after five years at Bar-Ilan University, I finally received my doctorate! This represents the culmination of a change in my life's direction that I not only did not foresee, but would have positively feared and hated. Twenty years ago, when I was twenty years old, I successfully fought against my parents, who were urging me to leave yeshivah and attend university. At the time, even if I would have attended university, it would certainly would not have been to study Jewish subjects. I looked at academics in the field of Jewish studies with deep suspicion, especially if they were also rabbis. Rabbis should be rabbis, and doctors should be doctors! A number of factors combined for me to finally enter Machon Lander, at the age of 33, as described in my post From Yeshivah to Academia. 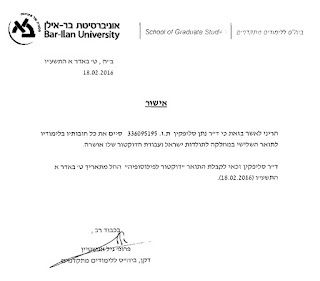 After obtaining my Master's degree, it seemed natural to progress to a doctorate at Bar Ilan. But which department should I choose? Since the Great Torah Science Controversy of 2004-2005, I had been fascinated by the following question: How can something seem so obviously true and traditional to some rabbis, and so obviously false and heretical to others? At Machon Lander, I had extensively studied the difference between the rationalist and mystical schools of thought, which contained the answer to my question. But the underlying point, indeed the key to academic Jewish studies, was context. I thus realized that Jewish intellectual history was where I wanted to focus, and so I enrolled in the Department of Jewish History. Since my MA had been in a course-based program, I had to prepare a thesis in order to be accepted to Bar Ilan's doctoral program. I decided to write it on the topic of different rabbinic interpretations to the Gemara about the sun's path at night. This is the key topic for all Torah-science discussion, and one that I had made a huge mistake in not bringing to the fore during the Great Torah Science Controversy. In my post The Sun's Path At Night Redux I described how I reworked this material to reflect an academic approach. With my previous "yeshivish" training, I had simply listed all the different interpretations of the Gemara, categorizing them as rationalist, mystical, etc. Under the guidance of Prof. David Malkiel, I realized that the key is that all the non-rationalist approaches began in the 16th century. This in turn enabled me to explore the context and reasons for this transition. After being accepted to the doctoral program, I had to attend a number of different courses. In Prof. Gershon Bacon's courses, I studied the development of Orthodoxy and ultra-Orthodoxy. These resulted in my papers The Novelty of Orthodoxy and The Making of Haredim. I was also fortunate to be able to attend courses by colleagues of mine in the field of Biblical and Rabbinic zoology, Prof. Zohar Amar and Rabbi Dr. Ari Zivotofsky. The main work in a doctorate program is the dissertation. It was difficult to choose a topic - there were several aspects of Torah vs. science that were tempting. Ultimately, however, I decided that it made the most sense to devote myself to a topic which would relate to my lifelong fascination with the animal kingdom. I wrote my dissertation on rabbinic encounters with zoology (which also included several conflicts between Torah and science, and which also related strongly to the issue of historical context). My dissertation focused on the nineteenth century, which was when the field of rabbinic zoology took off, with five books being written on this topic. In a future post, I plan to describe my dissertation in more detail. A number of thanks are in order. I would particularly like to express my gratitude to my dissertation adviser, Prof. David Malkiel, for his guidance and encouragement. I am also indebted to Prof. Gershon Bacon and Prof. Shaul Stampfer, and to my German tutor, Naftali Guttman. I am also deeply grateful to Rabbi Eliezer Langer and to my father-in-law, Mr. Lee Samson, who encouraged me to pursue academic qualifications. Prof. Menachem Kellner pointed me in the direction of Machon Lander, where I was blessed with the guidance of Rabbi Prof. Carmi Horowitz and Rabbi Prof. Yosef Tabory. It is deeply upsetting that my father, Prof. Michael Slifkin z"l, did not live to see my academic career, but my mother's nachas is enough for two people. I would also like to express my appreciation to the staff at the Biblical Museum of Natural History who enabled me to take some time off to finish my dissertation. Most of all, I am grateful to my wife Tali, for her unwavering encouragement and support, while putting up with my constant griping and groaning about how difficult the entire process was! Finally, I would like to thank my third child, Michaella. When my dissertation was finally printed, sitting on my desk and ready to be taken in to Bar-Ilan, she was looking at it. She said, "Aba, there is a mistake in your avodah." I laughed. "Michaella," I said gently. "You're eight years old. You didn't find a mistake in my doctoral dissertation." She pointed at the cover, where I had written the date. "You wrote תשע"ה. It's תשע"ו." Congratulations Rabbiner Docktor Slifkin :). I entered graduate school full time at age 32 and completed my doctoral work at age 37. I found that being older than the typical graduate student was an advantage. I was more mature and better able to focus on what was important. Mazal Tov to you and your family, R' Dr. Slifkin! I concur with Charlie Hall's comments that maturity is a major asset when it comes to graduate studies. My graduate-school classmates who had spent time in the "real world" were much more focused than the rest of us. Mazal Tov!!! An amazing accomplishment. Mazal tov! May you continue going me'choyil el choyil! Hearty congratulations. As the old timers used to say, when the rabbis became doctors, Judaism got sick. Mazal tov Rabbi Dr. Slifkin. May you go me chayil le chayil! Hey, you know what the Satmar Rebbe said about "rabbi doctors" - they are רופא חולים ומתיר אסורים. Big wink, and big Mazel Tov. It's a massive accomplishment, you and your whole family should be proud. And its great that you were able to synergize your dissertation with the encyclopedia, the history of rabbinic zoology was intressante. Mazal tov! A wonderful accomplishment and a great turn in personal development. May you continue growing and contributing to Klal Yisrael. Good catch Michaella. It's great to live in a time when we educate our daughters! Did you then explain to her the different opinions of the time since creation? Mazal tov! I am very happy for you. Mazal tov! May you continue to enlighten עם ישראל with your scholarship and candor. I am always inspired by your work! Mazal Tov! Huge accomplishment Doctor. Mazel Tov on this great accomplishment! Mazal tov Rabbi Slifkin! We all know to expect great things from you, and your impressive contributions to Judaism will certainly continue to grow. May you and your family find a thousand times more happiness and satisfaction in your present and future, than the undeserved pain and suffering of the past. Mazel Tov Rabbi Doctor Slifkin. Congratulations,Doctor! What makes it even more amazing is that you did this while at the same time creating and running a museum, publishing your biggest book, going on speaking tours and safaris, keeping up your blog, and being there for your family. They should give you an honorary doctorate in time management! Do you know who the first Orthodox PHD was? Mazal Tov! 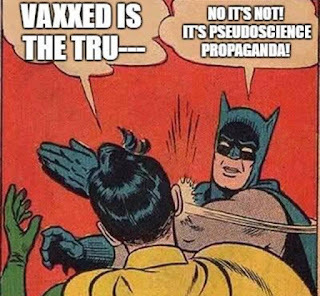 Please continue to bring your knowledge and opinions to the public at large. Mazal tov! A tremendous accomplishment. Mazal tov, Nosson, to you and Tali. May your amazing intellectual honesty continue to cast light into dark places. Very proud of you. Mazel tov! And great story about your daughter! Congratulations! Welcome to the club of RBS doctors! I would be pleased to read a published version of your thesis as soon as it is available. A random question regarding a post you linked: Is it possible that the discussions began in the 16th Century simply because that's when people began realizing that the Earth goes around the Sun? Is wishing someone Mazel Tov rationalist? Mazal tov and Yasher Koach! And kudos to your daughter Michaella for her sharp eyes! May your search for Emet continue to enlighten our generation and future ones! As someone who has been following you and with you all the way from the beginning of jblogsphere ....its been more than a decade I applaud you and your accomplishments! Wow!! Mazal tov and yiyasher kochacha!! Such great News!!! I just read your paper on the Sun's path and am excited to hear of your work... IT IS SOOOOOO IMPORTANT!!! Could not be happier for you and your family!!! Kol Hakavod, Rabbi Doctor Slifkin! Those of us who follow your work can't help but be delighted and impressed, and of are course wondering (in the best way) "what's next?" You have become a grand role model to show both my students and my children that Torah study and University degrees are not incompatible, but rather can compliment each other. With all due respect to R' Slifkin's accomplishments, such role models have existed for a long time. Yeshiva University has dozens of Roshei Yeshiva, and almost every one (the one exception is Israeli-trained) has at least a BA. Many have MAs, and a few have PhDs. Yes. To echo Nachum's comments, there are and have been many, many people who are both massive talmidei chachamim and highly educated. Taking it out of the academic realm, there are also countless men who were fluent in all areas of Torah and also successful business men. The two were never meant to be mutually exclusive. None of which is to diminish each individual's accomplishment, which is always something to be admired. Congratulations to Rabbi Slifkin! Her name is actually "David." And she herself states that it's not entirely clear whether he had a PhD. Of course, as one goes back in time, the distinctions become less clear, especially as matters weren't so formal back then. For example, it might well be that the Rambam- and even more so the Ramban- had the equivalent of a PhD for their time. As Rebbetzin David (the name she goes by) states herself, it's not entirely clear that he had the degree. As one goes back in time, though, matters get less clear, especially as things were less formal back then. You might say that the Rambam (and even more so, the Ramban) had the equivalent of PhDs. The question is, do / will her children and grandchildren have BAs like their grandfather? "Rabbis should be rabbis, and doctors should be doctors!" I once heard a witticism about Rabbiner Doktors from a critic. They are "rofei cholim", granted, but also "matir assurim"! May you be "matir assurim" as well, in the sense of hataras hasefeikos. Oy, You chose a soft "science" and not a real one ?! Congratulations! My great-grandfather was also a Rabbiner Doktor, and a German obituary in 1926 said that this made him an "ungewoenlischer Typ" (an unusual character). We need more such Typen, so kol hakavod! What an achievement! A doctorate to add to your smicha! I'm truly impressed and offer my hearty congratulations. Mazal tov! A belated mazal tov on your accomplishment. I was in Israel last week and encountered 2 of your favorite creatures, hyraxes (the biblical shafan), basking on a rock besides a walkway in the Nachal David nature reserve in Ein Gedi. mazel tov . great achievement.! Belated congratulations on this huge accomplishment, in the middle of serving as a husband and dad, writing books, running a centre and dealing with our shtik on a blog! R.E.S.P.E.C.T.! Congratulations, RD Slifkin. My late aunt Win Wisan, a historian of Galileo (PhD U.Florida 1972), used to say that history of science was a field mostly for people who had done something else but not succeeded as much as they would have liked. She had tried for physics, but never got beyond an MA. Which was enough to teach lower-level courses 50 years ago in a state school. I guess you hit the bans, and had to change course. It seems to fit you well.